BAM! I made a hoodie for myself. Check it out!! How awesome is it?? So freaking awesome, that’s how awesome. I found this fabric at a for charity sale that happens right around my birthday. Fabric is donated and priced at $1 per meter. This fabric was $2! TWO DOLLARS! Holla! I love it. I’ve been waiting to turn it in to a hoodie for myself ever since I got my hands on it in April. The EYMM Hoodie Blog Tour was the perfect opportunity to bump this project up to the top of my sewing list. Cheers to selfcare (or selfish, however you want to look at it) sewing! I used a zipper that was a little longer than I actually needed. When you reach the zipper construction portion of the instructions there is a link to Threads Magazine’s tips to shorten a zipper. I had a plastic zipper, and the article mentions using “nippers” to remove the excess zipper teeth. My initial thoughts: “Who the heck has these “nippers” just laying about? Crazy people, that’s probably who.” And off I wandered to my husband’s man cave beside my sewing room, doubtful that I’d find what I’d need. Yeah. Count my husband as one of the crazy ones. Just a few “nippers” laying about. During the sewing process, I posted a few photos on my personal Facebook and Instagram. When I posted the final hoodie someone asked if I was a baby carrying Mom. Truth be told, only occasionally. With four little kids, I probably should baby wear a lot more than I do. The question did get me thinking… How does the Asymmetrical Hoodie stand up to baby wearing? Not too shabby, actually. The fit of the hoodie isn’t form fitting, as it is meant to be a unisex garment. My chest measurement puts me in a women’s large (or D, since the pattern uses a letter sizing system). There’s enough room, and enough stretch in my fabrics, for me to wear my 13 month old, Jackson, in my Ergo carrier. However, it is a snug fit, so if you’re planning on making the hoodie or vest with the purpose of baby wearing, I would maybe go up one size. I love it. There are a few things I’d switch up for next time though. Thumbholes! I need them! I’d make cuffs with thumbholes next time. Also, it can be pretty freaking cold here, even in the fall. I might line the sleeves next time, just for the added warmth factor. Other than that, there isn’t anything I’d change. 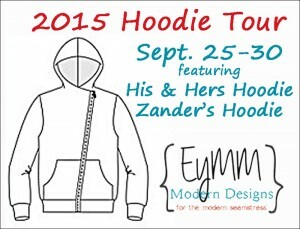 Want to WIN a copy of either EYMM‘s His & Her’s Asymmetrical Hoodie & Hooded Vest, or Zander’s Hoodie & Hooded Vest pattern? Just leave a comment! I’ll pick a winner using random.org at the end of the blog tour. What is this face? Seriously! With a 4 month old a baby wearing hoodie is something I’m adding to my must have list! Send me an email with the email address you’d like to receive your free pattern to, and your selection – His&Her’s or Zander’s. Joelle will be sending out your pattern shortly after that. My email address: elle_boisselle @ hotmail . com (you know, without all the spaces). Loving your fabric! And your hoodie! Looks great, and glad to see the fit with babywearing! It’s cute on you and so cool with that fabric! Good work! I love this! A unique hoodie…who wouldn’t! I love thrift store fabric finds! That hoodie is fabulous.